Pacific City is a campers dream. We have several county, state, and private campgrounds right here in town (see links on main page). Several local businesses cater to the campers needs with every possible want fulfilled. We are indeed the boaters paradise on the Oregon Coast. We have the Big Nestucca which is slow running with plenty of room for either canoeing, kayaking, or motoring. We have several river accesses with easy launching (see rivers link on main page). Many of our visitors paddle our large Nestucca estuary and canals. And don't forget the surf and open ocean for the daring kayakers. The only easier harvest of clams is to go to the grocery store. Take your fork or shovel during a minus tide and help yourself. Be sure to take a BIG bucket. Most of our crabbers are almost embarrassed how easy it is to gather a daily limit of dungeness crab. Sometimes the locals end up giving part of their catch to strangers on the street from just having more than they can use. Pacific City has several fine and fun restaurants, diners, delis and take out. Take a look at the Biz Directory and try them all. A happy tummy makes for a happy day. Be there when the Fishing Dories launch off the beach. We are one of only two beaches on the west coast where these brave hearts challenge the breakers to get out to the great fishing with their dories. Take advantage of our local charters to get the thrill of your life. Then give them plenty of room when you hear their horn blowing as they land their large flat bottom boats at full speed ahead. See Dory boat launch below! Pacific City is renown for it's fishing. We have an abundant spring and fall run of Salmon in the Big Nestucca right in the middle of town. Many of the best catches on the Oregon Coast are walking distance from our many overnight facilities. The river also serves a nice winter steelhead run. Town Lake (on the northern edge of town) is stocked very heavily during spring and summer with nice trout. Huge Ling Cod and other bottom fish are an easy catch in our surf. Next time someone tells you to go fly a kite, tell them only if you can do it on Pacific City Beach. We generally have a mild wind in the afternoons perfect for kite flying. Almost anyone can learn to hang glide and paraglide with proper assistance and supervision. Hang gliding starts with a ground school lecture, video presentation, and using a ground simulator. Starting on the flat beach, you learn the proper techniques of launching and landing. You then proceed to lower slopes of the Cape Kiwanda dune to get your first flights only 5 feet off the ground. This ground skimming is great fun and even children can do it safely. In fact, hang gliding teaches you the basics of aerodynamics, meteorology, and complex skill development in a beautiful location. Its a great activity for school and church groups, corporate teams and those wanting a more fun, exhilarating and challenging form of flight. We have some of the coolest hiking trails (all within walking distance). See the forest service site for details. Cascade Head is one of the local favorites and very rewarding. Pacific City welcomes all horses and their people. We have a restricted and well enforced speed limit downtown with bike paths (just right for horses). There shouldn't be any spook problems and all businesses would welcome a tie off out front. Bob Straub State Park is the perfect staging area with a large asphalt parking lot with designated parked for horse trailers. There are trails all through the park which winds through the spit with access to the beach. Enjoy video of horseback riding on beach in Pacific City below. 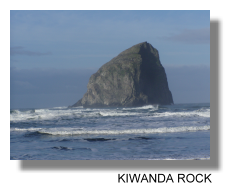 rock as Chief Kiawanda (note different spelling than Cape Kiwanda). The area was inhabited by the Nestugga Tribe up until the late 1800's with Chief Kiawanda as their leader. The Cape and Rock was referred to as "Chief Kiawanda's playground". If you look closely, you will see the profile of the Chief with this face pointing south and his "ponytail" being the loop on the north side of the rock. Grab some grub from one of many local eateries and take it down to the beach or one of several parks and "eat out". Food always tastes a little better with fresh air in the mixture. Sandboarding is the latest and coolest sport on the Oregon Coast and it is a popular sport among snowboarders who cannot wait until winter to board. You can't miss our mega sand dune. It is the backdrop of Cape Kiwanda and makes for a fun (and challenging) climb to the top. Most people run and jump their way down, but the daring Hang Gliders take advantage of our great updrafts the cape and warm sand make. There isn't a better vantage place on the Oregon coast to watch the migration of the Gray Whale. Climb atop of the cape and enjoy the spectacular view while waiting for ol' Moby to surface. Best sightings in March and May (then again in late fall). Many of our March/May days are very nice weather, sometimes even nicer than inland. "Thar she blows!" Pacific City is on the Oregon Coast. There are soooo many things to do on the Oregon Coast. Pacific City is on the Oregon Coast. Learn more about the Oregon Coast here! Are you looking for things to see on the Oregon Coast? The best thing to see on the Oregon coast is of course nature and the coast itself. Many interesting shipwrecks along the way worth seeing. It is also an indirect way of learning about the Oregon Coast history. The Octopus Tree, also known as The Council Tree is located north of Pacific City by the Cape Meares Lighthouse. Visit the Cape Meares Lighthouse and the Octopus tree at the same time! The three Capes Scenic Drive is one of the most popular and spectacular stretches of scenery on the Oregon Coast if not the entire west coast and it start right here in Pacific City. Cape Meares Lighthouse is located 10 miles west of Tillamook and is a short drive north of Pacific City.